The search engine optimization options allow you to change your HTML title tags as well as set up search data analyzation tools. 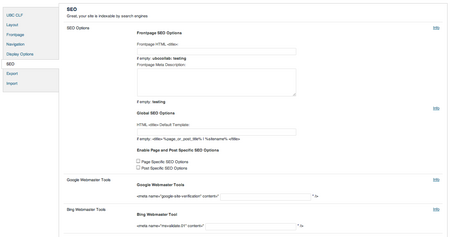 The SEO options can be found under Dashboard > Appearance > Theme Options > SEO. The section consists of 4 option sub-sections: SEO Options, Google Webmaster Tools, Bing Webmaster Tools, and Yahoo Site Explorer Tools.